Jax Lee, New Zealand Tree Grower May 2013. Over the last 20 years a truffle industry has been developing in New Zealand, with more than 60,000 infected trees now planted throughout the country on more than 150 sites. A number of these have been consistently producing truffles for some years, in areas ranging from north of Auckland to Canterbury. Most of the trees have been infected with Tuber melanosporum, commonly known as the Perigord black truffle, on oak or hazel trees. Currently Perigord truffles are being sold for about $3,500 a kilogram, mostly to local restaurants. There is also strong export demand from the USA, Europe and Asia. Main site conditions for successful production of Perigord truffles include a high level of calcium in the soil, indicated by a pH of 7.2 to 7.9, either from being naturally limestone soils or by artificially liming. In addition the soil needs to be friable and free draining and have a sunny aspect. Successful fruiting of the fungus requires soil temperatures reaching 25°C or more for a period in the summer. There are also requirements involving weed control around the tree base, pruning to allow light and heat on the soil around the tree and watering during dry spells in the summer. Generally trees are spaced about five metres by four metres or 450 per hectare. They first produce truffles anywhere between four and seven years after planting. As more is understood, the time to the first truffle has been trending down, with examples of truffles being found three years after planting. The usual production pattern within a plantation is for trees which start producing to continue production each year and for more trees to come into production each year. Once the first truffles are found, provided sound husbandry is then followed, extra trees rapidly come into production for the first time. As a result, harvest yields tend to rapidly increase once production starts. 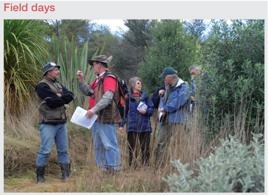 Some sites in New Zealand are now producing at a rate in excess of 100 kilograms a hectare. Truffles are harvested any time between June and August. A factor, often overlooked in preliminary planning stages, is in having properly trained dogs to find ripe truffles. 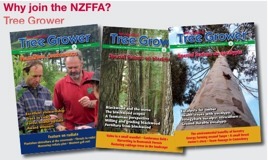 More growers throughout New Zealand are now contracting truffle-hunting services. There are now some sites in New Zealand planted with either Burgundy truffle or Bianchetto truffle. Both of these truffles have advantages over the Perigord in that they are less site-specific with regard to main requirements and they have a greater range of possible host plants. They are also much less fussy with regard to overall management. Bianchetto have been successfully produced from a number of different pine species and Douglas fir. This opens up possibilities for an added income stream from timber woodlots. In the years between planting and harvesting for timber, additional income could be received from truffles. This income could be earned without any hands-on management input from the forestry owner. One way this can be done is by working with companies such as Southern Cross Truffles Ltd. A forestry owner can approach them and agree on a site and how many truffle-infected trees will be planted. Usually it would be trees around the edge of the lot, around three to five deep. Once this number is agreed the forestry trees would be infected with a suitable truffle for the site and management style. The forestry owner would then continue to plant as usual but under the guidance of a site manager. The forestry owner would continue to manage the block for timber while giving a truffle management company access to the site at certain times of the year for the management and harvest of the truffles. After a set period of time the forester can fell the trees for timber. Both harvesting and marketing also need to be considered when trees start to produce. Once tree growers start producing truffles many do not know how to go about harvesting and marketing their produce. Once the truffles are harvested the management company should be able to offer a service to do all the cleaning, grading, packaging and sales of truffle for other producing New Zealand truffieres. Cost and payment would be discussed with the individual on an individual case basis. Jax Lee is General Manager at Southern CrossTruffles in Templeton, Christchurch.